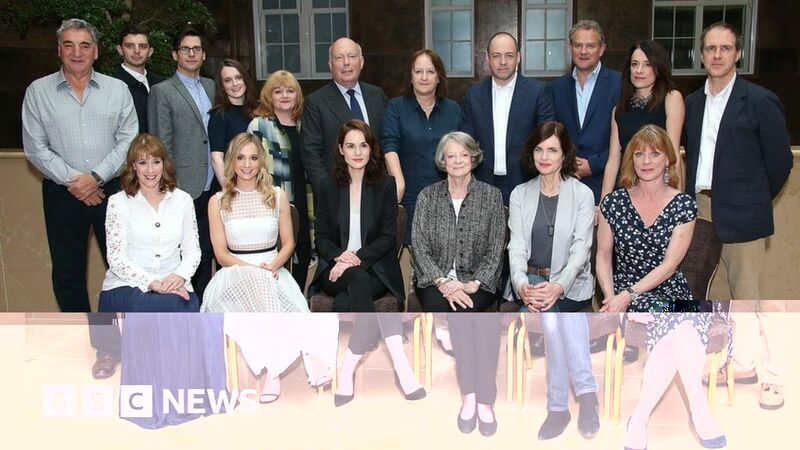 Shooting the movie version of TV drama Downton Abbey feels like the “reunion” of a very “happy” school, the show’s creator Julian Fellowes has said. The writer was back with the cast last week at Highclere Castle, Berkshire, to start filming the big screen revival. He said seeing the reassembled cast in their costumes was a “surreal moment”. But Lord Fellowes said he wasn’t making any assumptions about the potentially tricky transition from the small to the big screen. “In life you can’t let yourself be daunted by the fact that it doesn’t work out for some people,” he told BBC News. “You just have to keep charging on and have a go and do your best… I don’t think one should expect everything to be a triumph. Lord Fellowes is no stranger to Hollywood success, however, having won the Oscar for best original screenplay for Gosford Park in 2002. Going from television to film does present different challenges, he said. “[In a series] we usually give the big stories to maybe three characters a week… By the end of the series everyone would have big stories and it would all be plaited together. “In a film you can’t do that. Every character you include you must have their own story. The viewer can judge whether or not I have been successful, I wouldn’t make any claims. “I had to make sure every story of every character was completed within the movie. That did take a certain amount jiggery-pokery, but I am pleased with where we came to and very pleased with the reassembled cast. “I was at Highclere [where the TV series was shot] on Friday and there was something almost surreal seeing them back in their costumes. Details of the film’s plot are being kept tightly under wraps, and Lord Fellowes said he never answers questions about the storyline. Nostalgic fans will have to wait until next year for the Downton Abbey movie to be released. The TV series ran from 2010 to 2015, winning 15 Emmys and three Golden Globes, with the finale watched by almost 11 million people in the UK on Christmas Day 2015.